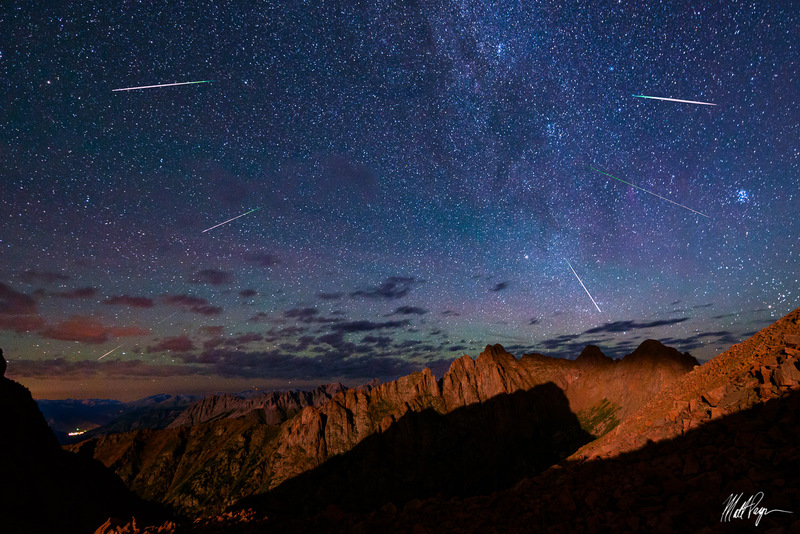 In order to capture the impressive Perseid Meteor Shower, I hauled my photography equipment on a grueling 7-hour backpack up one of the steepest trails I've ever hiked to the 13,000 foot gap between 13ers Pigeon Peak and Turret Peak in the Needle Mountains of Colorado (a sub-range of the San Juan Mountains). 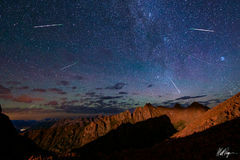 The result was this magical scene in which I was able to gaze upon cascading meteors and stars for three hours while shivering high above the towns of Silverton (seen bottom left) and Durango as the setting moon illuminated the ever impressive Animas Mountain and Monitor Peak across the valley from me. This mountain range sits in the Weminuche Wilderness Area of Colorado, one of my absolute favorite places on planet Earth to visit.